In an earlier post, I vented a bit about the relevance of performance related pay for teachers. 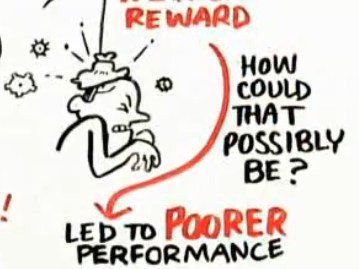 Well, I recently watched a short (10:48) RSA Animate video based on a lecture by Dan Pink, in which he explores how people are motivated. He suggests, and he is supported by reams of research over the last 30 years, that money only motivates where the task is a simple one requiring little mental effort - not teaching then! However, what really does motivate are three things: Autonomy, Mastery and Purpose. Controlling management approaches assume people are passive and inert and require prodding - the Victorian idea of Theory X!. Autonomy approaches assume people are active, looking for interesting work and curious and self-engaging. Autonomous motivation has proven to promote greater conceptual understanding, result in better grades, enhance persistence at school and in sporting activities, generate higher productivity, less burnout, and greater levels of psychological well-being. Mastery is the desire to get better at something that matters - and it must matter to the individual. First, mastery is a mindset, in that we either believe we can get better or we don’t. Second, mastery is a pain, in that it involves not only working harder but working longer at the same thing. Finally, mastery is an asymptote, or a straight line that you may come close to but never reach. Other work has suggested that we can only really get close to mastery after 10,000 hours of effort/practice. Purpose provides a context for autonomy and mastery. Purpose is that inner drive, sometimes facilitated by a great leader, to do something that actually matters - educating children rather than ripping off bank customers. I wonder if Mr Gove has seen this, or perhaps he thinks that teaching is a mindless repetitive job! ?